In Japan, some TV campaigns are just rubbish. However some go down in legend. For example Tokyo Gas once ran a campaign with the tag line "My life, My gas". Probably should have had that one run by a native speaker first but at least it has gone down in legend. Kentucky Fried Chicken managed something else though. 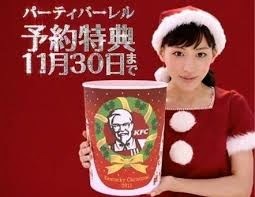 In the 1980s they ran an Xmas campaign in Japan under the banner "Christmas isn't Christmas without Kentucky Fried Chicken". People took this seriously and it has actually managed to enter modern day popular culture. Tonight, on Christmas eve, people will queue up to collect their bucket of pre-ordered KFC's finest and later sit down to enjoy their family evening. And they'll be happy. Merry Christmas wherever you may be and whether or not you have chicken wings. Xmas Party Pack - Order before 30 November!